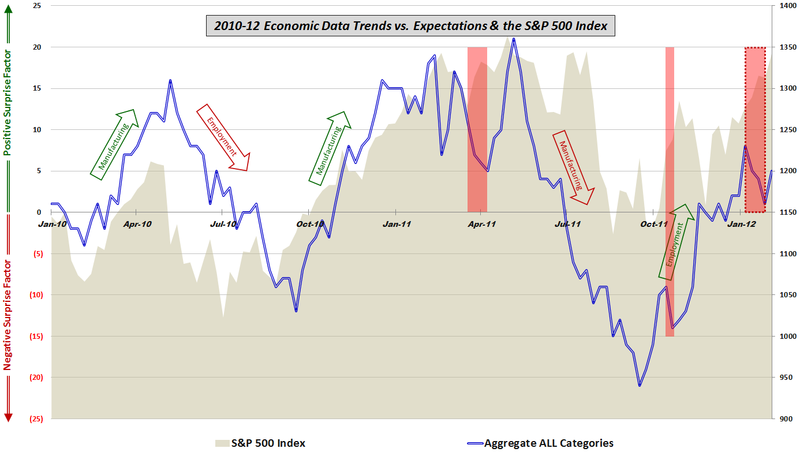 VIX and More: Economic Data: Divergence or Confirmation for Stocks? “One could certainly make the case that data underperformed stocks from April to September, but has been outperforming stocks for the last 2 ½ months. With the benefit of hindsight, clearly the stocks have been in the driver’s seat and to some extent, the increase in stock prices has had a positive effect on the economic data. For the better part of January, there was a substantial divergence (see dotted red box in graphic below) between stocks and economic data, with stocks in a marked uptrend, while economic data were falling short of consensus expectations on a regular basis. It is possible that last week’s nonfarm payroll data and ISM services index marked a turning point in the performance of economic data relative to expectations, yet it is also clear that the data trend still lags the stock price trend by a significant margin. For this update, I have annotated the graphic with arrows to show where manufacturing and employment have been the economic underpinnings of a rise in stocks. This time around the employment data seem to be moving in the right direction, but manufacturing has had trouble living up to expectations – at least for the past two months.